0402_evlo_evmbLittleSisters0213crop: Singles: News-Editorial: Award-Winning Evansville Photographer: Molly Bartels specializing in editorial, wedding and art photography in Evansville, Indiana. 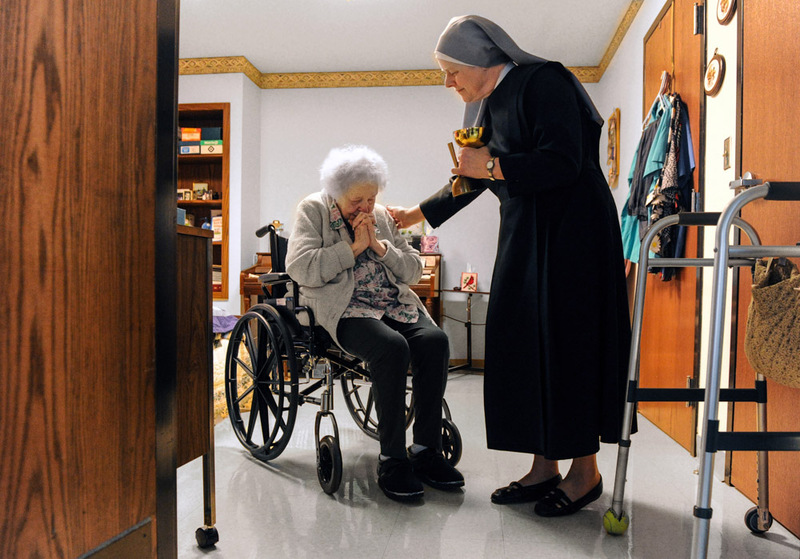 Bea Belcher receives communion from Sister Carolyn Martin recently at St. John’s Home for the Aged, which is run by Little Sisters of the Poor, in Evansville. Belcher, who started in the independent living apartments in 1987, has been at the facility for 25 years. “They’ve always been so good to me here,” she said. Last spring the Little Sisters announced that they planned to withdraw from operating the home once they found a suitable sponsor to take over. They are still searching and continue to seek financial donations for the home.